Have you ever secretly prepared a gift, a surprise for your loved ones? If so, then try to remember, how did you feel, how was it to wait until the moment when they will finally find out what you have prepared? Remember that excitement… impatience… I can remember our children secretly preparing gifts for us, and once the surprise was ready… guess what? They just couldn’t wait, they had to reveal it to us, so that they could experience the joy of giving and see how much joy their gifts bring to us. That moment of revelation, when the curtain of secrecy is lifted, when the waiting is over, that moment is a moment of sheer joy. Now, use your imagination and try to picture how our loving God may feel as He waits for us to see what He has prepared for us? It’s been a long time. Long time before He revealed His plan of salvation in Jesus, and also long time since Jesus from Nazareth walked among us. Today we read Matthew’s record of this rather strange and mysterious event, which is popularly known as “the visit of the wise men”, which is about Jesus being revealed to the nations. I think that many perceived it just as a part of children Christmas plays. Some strange people came and brought gifts. But what an event it is! It is a bomb! It is something sensational! Something unbelievable. Let’s try to unearth what has been lost and see what an unbelievable God we have and what an unbelievable message He has sent to us in His Holy Scriptures. Jesus was born just 10 km south from Jerusalem in the days of the great king Herod. There is not much about Herod mentioned in the New Testament, but he was quite a figure, according to ancient historians. A great politician and so ambitious with his construction projects, you can still go and visit them. But not so great in family relationships. Suspicious about any threats to his power Herod had murdered two of his wives and three of his sons, just to be safe. And that was in his city where those men from the East suddenly showed up asking “where is he who has been born king of the Jews?” Who were those men? I guess this is one of the most intriguing questions. We can’t know it for sure, but there is one explanation, favored by many, that can give us a glimpse of how much our loving God does to reach out to all people, to all nations. We need to travel even further back in time, to 6th century BC, to meet one of the most influential man in history. As teenager he was forcefully taken to Babylon. And that is where God used him, mightily. Babylonians valued all sorts of knowledge. They had the whole class of people consisting of magicians, enchanters, astrologers, sorcerers, and so on. One day they all lost the favor of their emperor. Why? For they were not able to explain to the emperor his dream. He got really angry and commanded to kill them all. God intervened, and this young and pious man explained the dream to the emperor. Thus he not only saved the lives of all the magi, but also become the right-hand man to the emperor Nebuchadnezzar II, the most powerful among all Neo-Babylonian emperors. This young man’s name was Daniel. He served in the royal court for more than half a century. Then he became very influential in the court of Cyrus, the great emperor of Persia who conquered Babylon, and built the largest empire known to that day. God used Daniel’s position in both these great empires to reveal Himself. This is such an amazing stuff! The message about the true God, the God of Daniel was sent to everyone in Babylonian and later Persia empires. You can read more about this in the book of Daniel. But that’s not all. Daniel wasn’t simply a very influential man. He wasn’t simply a man who survived being thrown into lions’ den. God also used him to reveal the future. It was Daniel through whom God precisely predicted how Babylon will be succeeded by Persian and Persian by Macedonian empire, and Macedonians by Romans. And then [!] the Almighty God would build His own Kingdom that lasts forever. That was Daniel though whom God revealed when these events will take place. When this everlasting empire will be founded. Daniel wrote down these prophecies and we have them in the book that bears his name. It’s incredible! We know that his writings were kept and copied not only among the Jews who lived in Babylon, the book of Daniel become a part of the Old Testament. However, we can also assume that Daniel’s influence extended beyond the Jews, among the royal servants and magicians of Babylon as well. He might have left them just enough information, enough clues that enabled them five centuries later to detect that the promised King of the Jews, Jesus Christ was born. The star that they saw raising in the East, signaled that the fulfillment of the time has come. So they packed their caravans, they took their expensive gifts and traveled to Jerusalem in search of the newborn king. When Herod the king heard this, he was troubled, and all Jerusalem with him; and assembling all the chief priests and scribes of the people, he inquired of them where the Christ was to be born. They told him, “In Bethlehem of Judea, for so it is written by the prophet. Herod, as we read, wasn’t exactly happy to hear this news, and the whole Jerusalem was troubled, not knowing what to expect from this violent man. What is going to happen? It is interesting, Herod turns to the chief priests and scribes with the question, where the Christ was to be born. And they just looked it up in the Scriptures. In Bethlehem, for so it is written by the prophet. What is truly amazing is the way Matthew quotes this prophesy. And the thing is that this is not just about one prophesy. There are several! And Matthew alludes to them in his gospel account. For they all point to this very moment. To gentile prophet Balaam (15th century BC) it was revealed that the star will come out of Jacob (Num 24:17). To the king David (10th century BC) it was promised that his descendent will sit on the throne forever and His kingdom will have no end and that He will shepherd His people, Israel (2 Sam, Ch. 5 and 7). Through Isaiah (8th century BC) it was prophesized that “nations shall come to your light, and kings to the brightness of your rising”. (Isa 60:3) Ezekiel and Jeremiah (6th century BC) speak about the shepherd of the Lord, God’s servant David, who will shepherd God’s people. Finally it was Micah (8th century BC) to whom it was revealed that this mighty ruler will be born in Bethlehem. See, all these voices merge together is this wonderful symphony. This is the Triune God speaking through them and telling, – “the time has come, I will reveal my glory to my people, and all nations will come to me”. The time had come to reveal the gift that God had prepared for us. The influential men from Babylon were the first to come to the newborn King. But one misunderstanding we need to clear away. They may have been wise and influential humanly speaking, but they had no idea about what was going on apart from the cues that God had given to them. They didn’t come to Jesus because of their wisdom. They had received God’s own revelation, perhaps through Daniel the prophet, but definitely through the mysterious star. And what do they do? They rush to Jerusalem, straight to the palace of this murderous king Herod to tell him that he has got a new competition. Thank you, guys, for your wise help! Then they had to be guided by the Scriptures again, by Micah the prophet. They must have been going through the mix of emotions. The star had appeared. They had come to the right country. So far so good. But there was no newborn king in the palace. Instead, the whole city was troubled. It was only two hours walk to Bethlehem. But then suddenly, what is that?! The star that they had seen when it rose went before them until it came to rest over the place where the child was. 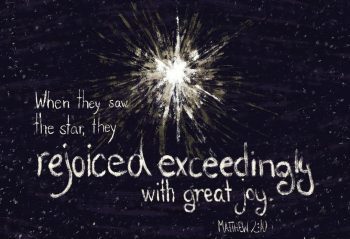 When they saw the star, they rejoiced exceedingly with great joy. Of course they did. It had been a long trip. The star had disappeared. In Jerusalem they had found nothing but disappointment. No one even knew that there was a new born king. And now they were heading to some strange village. But suddenly, the star was back! Their divine Guide was back, taking them by hand and leading them exactly where they needed to go. What a relief, what a joy! Matthew emphasizes that they rejoiced with exceedingly great joy! That joy comes when we you feel safe in the hands of the Almighty, of your loving Father, when you are assured that He is with you, cares for you, protects you and guides you wherever you need to be. That nothing and no one can harm you, for He is with you always. They had been miraculously led to Jesus, and they had brought Him their royal gifts. Now they fell down and worshiped Him. Most likely they still didn’t know who exactly this little boy was. The star had led them to this poor neighborhood, to this simple house, with these ordinary people and this baby. How could they recognize that this baby is the same Son of God before whose throne of glory all nations will be gathered when He returns in His divine majesty with all his angels. Hopefully they will be there to see Him again. What a wonderful message this is! Our God goes to such great length to reveal Himself to us. To each one of us. We have no idea how much effort He has put into getting us here. How many generations He has used to preserve the Gospel so that we can hear it, how many obstacles removed. One day we will know it. But today we are the blessed recipients of this message. The same Word of God that was revealed to the prophets, and recorded by evangelists, is now entrusted to us – to listen, to learn, to rejoice and to share. Our loving Father in Heaven does all of this for He can’t wait for the moment when His greatest gift, His greatest surprise for us, the New Heavens and New Earth will be revealed to those who long to be with Him. Then we will finally be where we belong, with our Father, with our brother Jesus, and with multitudes of God’s people. And then we all will rejoice with exceedingly great joy. Forever.